Indonesia's most active volcano, Mount Merapi, erupted early Friday, spewing sand and pyroclastic material and sending an ash column as high as 5,500 meters (18,045 feet) into the sky. 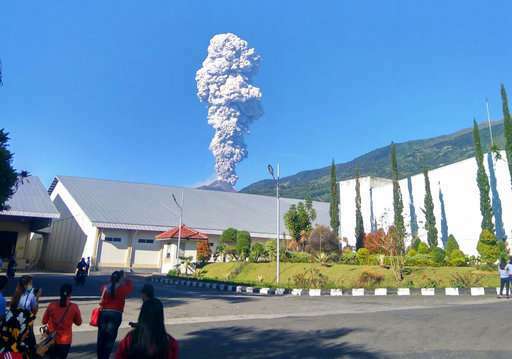 The sudden eruption was accompanied by a rumbling sound with medium to strong pressure, Disaster Mitigation Agency spokesman Sutopo Purwo Nugroho said. People living within 5 kilometers (3.11 miles) of the crater evacuated to barracks set up for the displaced or left for other safe places. Nugroho said Adi Sucipto airport in Yogyakarta was closed for about one hour due to the spread of volcanic ash. It has reopened. 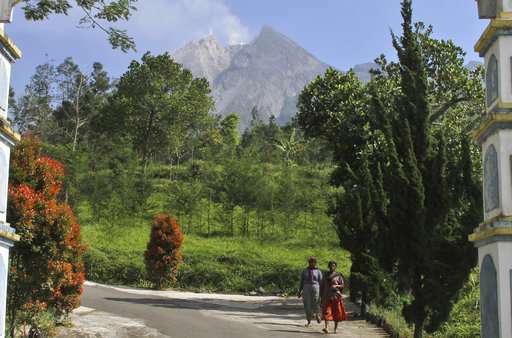 The eruption, however, did not raise the alert status of Merapi, which is at a normal level with no eruption expected in the foreseeable future. The 2,968-meter (9,737-foot) mountain between Yogyakarta and Central Java provinces is the most active of 500 Indonesian volcanoes. Its last major eruption in 2010 killed 347 people and caused the evacuation of 20,000 villagers. Indonesia, an archipelago of more than 250 million people, is prone to earthquakes and volcanic activity because it sits along the Pacific "Ring of Fire," a horseshoe-shaped series of fault lines.